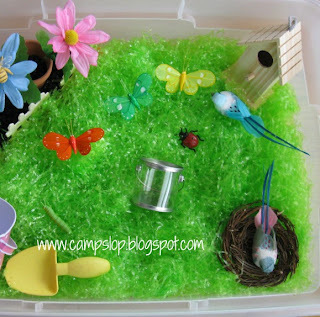 The warm weather has inspired me to change out the sensory bin for something more Spring-like! The base of the bin is Easter grass and black beans (for the garden area). To keep the two bases seperate, I used a line of playdough across the bottom of the bin and inserted the fence pieces. It's not perfect, but has done well so far. 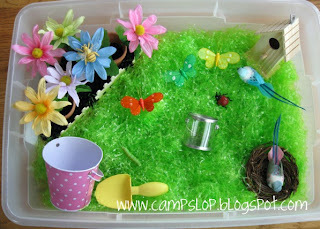 The grass area of the bin features a birds nest (Micheals), 2 birds (Dollar Store), feather butterflies (Dollar Store), a metal bucket (Target Dollar Spot), a shovel, a wooden birdhouse (Dollar Store), a tiny plastic paint bucket that has been used as a bug jar (Michaels), and various plastic insects (Insect Toob ). The wooden fence posts are from Michaels. 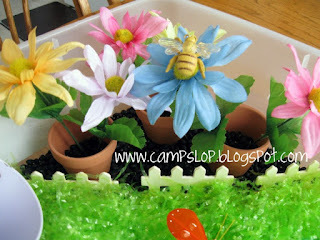 The garden area has 3 terra cotta pots (Dollar Store), silk flowers (Dollar Store), and a plastic bee (Insect Toob ). I added some black beans inside the pots so the flowers can be picked and planted. The kids quickly added some pompoms to be used as both eggs and seeds to plant the flowers. They also managed to find the watering can I was looking for!